My sweet baby boy turned 1 at the end of September. I never thought that I would be one to throw a big, huge, 1st Birthday Party for my son, but after such a crazy year (and all of the adorable ideas on Pinterest) I just couldn't resist throwing a celebration of Weston's first year of life. Weston's room is woodland themed and I absolutely adore anything that is adorned with cute little forest animals. So I decided on a woodland theme. Since I work part-time, money is sometimes kind of tight, so I didn't want to spend a fortune on food and decorations, so I opted for printable and DIY decorations and used some items I already had around the house. 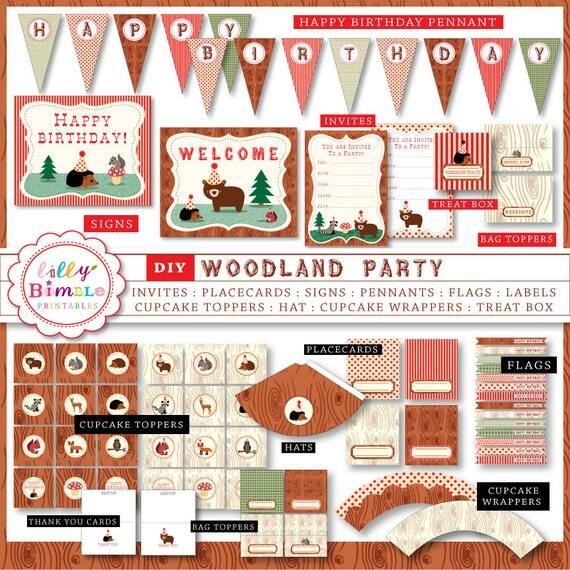 About 6 months ago, I stumbled upon this printable Woodland Party Kit by Lilly Bimble and it was on sale, so I immediately purchased it. (Unfortunatley, I didn't get to use the entire kit. I had planned on making some party hats and table tents the day before the party when I returned from a business trip, but because of a fire at an FAA facility in the Chicago area, I almost didn't make it home for the party, so I just used what I had already printed). I used a number of items I had around the house to create a 'tablescape' and purchased a bunch of tissue paper in the color theme to make the tissue paper balls. Towards the end of September it gets kind of chilly around here so I opted for some cheap and easy cold weather food and put together a chili bar. We borrowed tables and chairs from family and friends and hoped for nice weather since we had planned for the party to be outside. When I returned home from my work trip at 2:00 a.m. the morning before the party I wasn't sure if Dennis and I would have enough energy to get a party together in the morning. But with a lot of help from our families and some beautiful weather, we put on a surprisingly awesome 1st Birthday Party for our Weston and I couldn't be happier with how the day turned out.! I was able to edit the invitations with Adobe Acrobat using a similar font and color. My father-in-law is in printing, so he printed them out on nice cardstock and cut them for us. This can easily be done at Office Max/Office Depot or any other local printing shop, or at home. I didn't notice this before, but you can also purchase a custom printable invitation. Guests were greeted at the driveway with one of the printable Happy Birthday signs and balloons and again at the gate to our backyard with the printable Welcome sign and a tissue paper ball that I made. I put the printable signs in frames that I had laying around the house (from IKEA) and taped some yarn to the back so they could hang over the posts. I followed this tutorial for the tissue paper balls, leaving enough string to be able to tie it around a fence post. For the 'tablescape,' I used some decorations from Weston's room, some moss mixes, and two potted ferns. The banner was made by sister (who blogs on Multi-Purpose Mama) using her Silhouette. The deer, owl, and bird figurines are Christmas ornaments that I purchased on sale last year, the week after Christmas. They usually sit on a shelf in Weston's room. I removed the Christmas paraphernalia (Santa hats, scarves, etc) and hooks to make them more year-round woodland creatures. The two trees are also Christmas decorations purchased on sale. It's hard to tell, but the woodland creatures are sitting on a wood slab covered with a moss mix (available at most craft stores or dollar stores). I painted two terra-cotta pots red to match the color scheme and planted Autumn Ferns that I purchased at Home Depot. I later planted these in my garden. The table is covered with Gold Gingham Oilcloth. Over the years I've put together a party box (post coming soon) with reusable dinnerware, silverware, and serving platters. I use these for almost every party and the only things we have to purchase are napkins and cups. The party was so fun, we forgot to take pictures of the chili bar! For the chili, I used this recipe from Cooks.com. My Mother-in-law made cornbread using this recipe from AllRecipes.com, but she used 2 cans of creamed corn, and one can of corn kernels. For toppings, we laid out shredded cheese, chopped onions, and jalapenos. For 100 people, we used about 5 lbs of cheese, 10 onions, and one large jar of jalapenos. We also put out a few different types of hot sauces (Tapatio, Cholula, and Frank's Red Hot), so guests could choose their own spice level. My aunt made this AMAZING & DELICIOUS woodland themed cake!!!!!!!! Isn't it AWESOME??? Weston wanted me to have the first taste! Here at It's A Wonder, we're always game for a fun party. Share your party ideas with us in the comments below! Kathryn has given you a basic rundown of cloth diapering, so I am just here to share what works for our family. When I found out that I was pregnant, there was no doubt in my mind we would use cloth diapers. I am pretty sure my family wanted to have an intervention for me but instead they used fear tactics. They all recanted stories about dunking poopy diapers in the toilet and sticking themselves with pins. But fear did not prevail. I was armed with information after consulting the cloth diaper guru in our network of friends (Kathryn) and doing my own research. When Weston arrived, I am sure everyone still had their doubts, but they all jumped on board and haven’t complained yet! Not to my face anyway. Dennis and I decided that we wanted to try cloth diapering Weston from the beginning, so after much research we purchased a set of newborn AIOs and the Hybrid Live Package (shells and soakers) from Grovia. You can read about our experience cloth diapering a newborn here. Kathryn has already filled you in on AIOs, so this post will be about our experience with hybrid diapers. Over the past year or two, a new trend has emerged in baby and kids footwear. Behold the moccasin, or “moccs” as they are more lovingly known by most fans. These soft sole shoes are usually made of leather or suede and have an elastic opening, making them easy off and on for Mom and Dad, but also allowing them to stay on your little one’s feet. I'm dying to get a pair for my daughter, but lately she has been quite picky about what goes on her feet. Over the summer she would pretty much only wear a pair of pink and purple neoprene Nike sandals we bought her for the beach. These days it's a black canvas slip on shoe I purchased on a whim from Walmart! Go figure, my two year old has a mind of her own. You’re right, the moccasin isn’t a new shoe. In fact it’s been around for ages and Minnetonka has made and still makes some pretty awesome moccasins! My husband even has a pair of moccasins that he wore as a toddler! However, there's a new kid in town when it comes to these soft soled shoes. The most familiar brand, and one you may recognize from the ABC show “Shark Tank,” is Freshly Picked. Susan Peterson and her adorable moccs were already quite popular with trendy moms and she had a small celebrity following when she appeared on the show in May 2014 and struck a deal with Daymond John. Since then, her brand has grown tremendously, including many new colors, a collection of totes and clutches, and recently she announced that limited colors of her moccs will now appear in on Nordstrom.com and in select Nordstrom stores. The price point hasn’t changed ($60 for most colors and designs) and the moccs are still made in the USA. Freshly Picked certainly isn’t the only place you will find these adorable and stylish baby and toddler shoes. I’ve collected a few of my favorite mocc makers below--each offering a different take on this cool “new” trend. Check them out and grab a pair for your little one this fall. They’ll no doubt be the coolest baby on the block.